Electrocardiographic (ECG) abnormalities and cardiac arrhythmias are frequently observed in acute stroke. Current evidences have shown that autonomic dysregulation plays a key role in the underlying mechanism. However, the precise pathophysiological pattern and modulation are still uncertain. 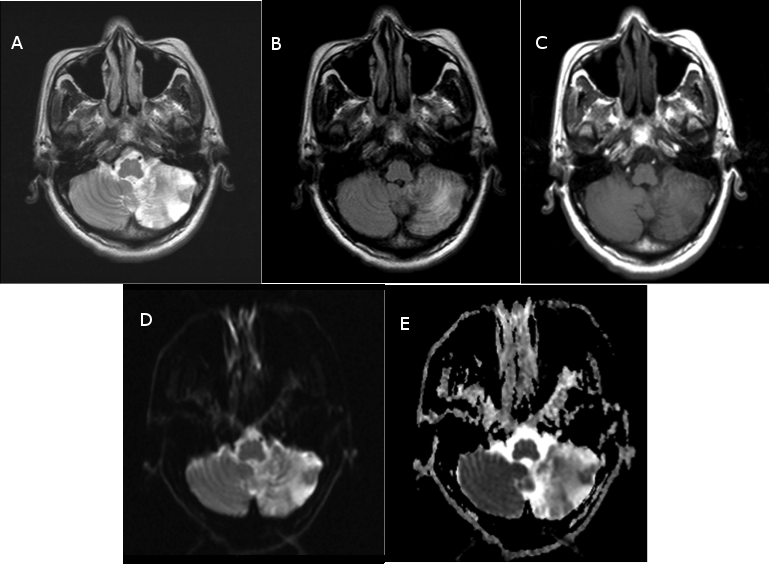 We report the case of a 58-year-old man who presented with sudden onset of giddiness, vomiting, and diaphoresis, which subsequently confirmed the diagnosis of left cerebellar infarction on Computed Tomography (CT) Brain and Magnetic Resonance Imaging (MRI) Brain. 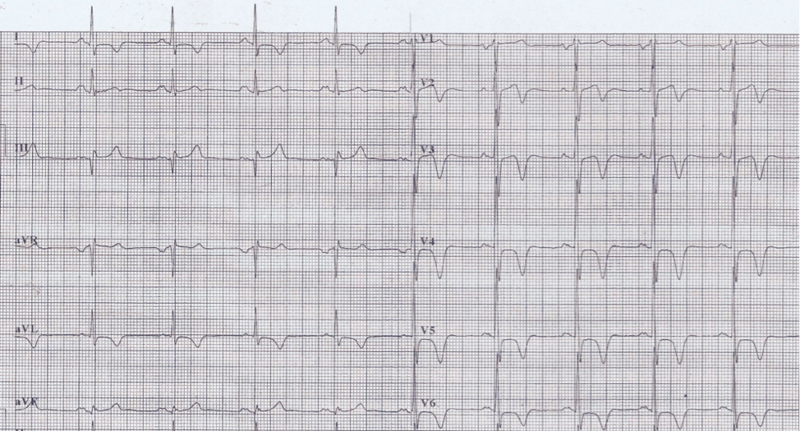 His serial electrocardiographies during the acute stage showed progressive ischemic changes. Further investigations with echocardiography and myocardial perfusion scan showed no evidence of ischemic heart disease. This is an uncommon case for which we observed significant ischemic changes in electrocardiography for cerebellar infarct. A 58-year-old gentleman with underlying Type II Diabetes Mellitus and Essential Hypertension presented with sudden onset of giddiness, vomiting, and diaphoresis for 6 hours duration. This was the first episode, and he had no limb weakness, speech disturbance or anginal symptoms. Systemic reviews were unremarkable. He was diagnosed with Type II Diabetes Mellitus and Essential Hypertension 4 years ago and was on Tab Metformin 500mg twice daily, Tab Felodipine 10mg daily, Tab Atenolol 50mg daily, Tab Lovastatin 20mg daily and Tab Aspirin 75mg daily. He was compliant to the medications and had not experienced any side effects before. There was no significant family history or surgical history. He was a smoker with 10 pack-years history but not an alcohol consumer. Neurological examinations revealed left sided nystagmus, dysmetria and tendency to fall toward left side on tandem gait. The blood pressure was 136/72 mmHg, and heart rate was 57 bpm. His higher functions, cranial nerves, peripheral neurological examinations and other systems were normal otherwise. His basic blood investigations were unremarkable (Table 1). The diagnosis of left cerebellar infarction was confirmed by Non-enhanced Computed Tomography (CT) and Magnetic Resonance Imaging (MRI) of the brain (Fig. 1 A-E). Figure 1. Magnetic resonance imaging of the brain. There are wedge shaped high signal intensities seen on T2WI and FLAIR (A, B) images and low signal intensity on T1WI (C) within the posterior inferior aspect of the left cerebellum. On DWI/ADC (D, E) images, there is no area of restricted diffusion within. There are associated surrounding T2/FLAIR high signal intensities representing area of gliosis as well as volume loss indicating old left cerebellar infarction. The ECG revealed sinus rhythm, ST depression and deep T wave inversion over anterolateral leads with progressive changes over first 3 days of admission (Fig. 2 & 3). 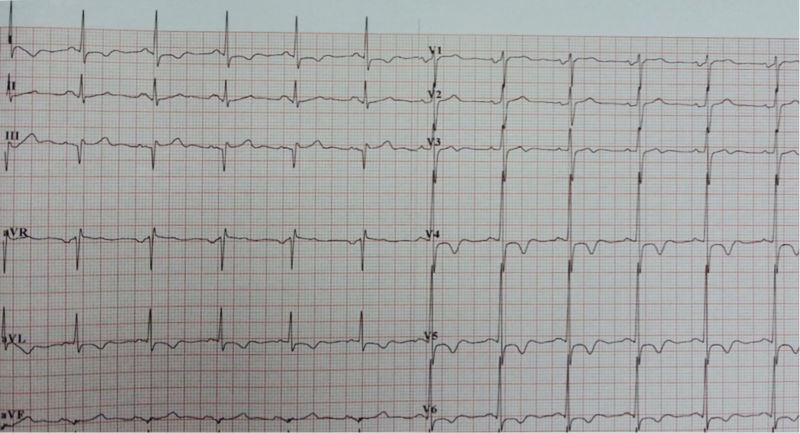 The patient had no anginal symptoms despite ischemic-like changes on ECG. The possibility of acute coronary syndrome was suspected. The cardiac enzymes were not raised. The echocardiography revealed mild ventricular hypertrophy with no regional wall motion abnormality and subsequent myocardial perfusion scan showed no evidence of coronary artery disease. Figure 2. Electrocardiography during acute phase of stroke on admission. He was referred to Neurology Team and treated with Tab Cardiprin 100mg daily, Tab Simvastatin 20mg daily and oral antihypertensive medications. A follow up care was done on Day-10 of stroke at outpatient clinic showed partial resolution of ECG changes, T wave normalization at V2-V3 and lesser depth of T wave inversion in other leads (Fig. 4). The patient remained asymptomatic of cardiac disease, and neurological symptoms and signs were subtle. Figure 3. Electrocardiography during acute phase of stroke 5 hours later. Electrocardiographic (ECG) abnormalities in acute stroke have been observed since 1947 . The ECG changes in subarachnoid hemorrhage was first described by Byer et al. Subsequently, there are substantial reports showing that ECG changes are present in acute phase of stroke, where it can be found in 60-90% of intraparenchymal bleeding or subarachnoid bleeding, and in about 5-20% with acute ischemic stroke [2, 8]. The morbidity and mortality in stroke are known to be very high in patients with concomitant coronary artery disease. This phenomenon of nonspecific ECG changes in acute stroke has therefore posed much diagnostic and management dilemma to treating physician. Figure 4. Electrocardiography on Day 10 of stroke. There is a very considerable heterogeneity in ECG abnormalities in acute stroke. Over the years, literature data have showed that the ECG changes can range from asymptomatic repolarisation and ischemic-like ECG-changes to heart block and ventricular arrhythmias [3, 4]. The wide range of ECG changes in acute stroke might be indistinguishable from those who suffered from myocardial ischemia/infarction, in addition to those who already have underlying hypertension and coronary atherosclerosis with baseline abnormal ECG changes. The study done by Goldstein showed that the most common abnormalities in acute stroke were QT prolongation (45%), ischemic changes (39%), arrhythmias (27%), tachycardia (28%), and U waves (28%) . The recognition of this common repolarisation abnormality hence becomes very important from prognostic point of view as it forms the basis for generation of torsade de pointes and malignant arrhythmia. A more recent systemic review by Khechinashvili and Asplund in 2001 revealed that ECG depolarization and ischemic-like abnormalities (ST depression and elevation, pathologic Q wave, T wave changes, QT prolongation and bundle branch block) were found in 75% in selected SAH patients when those with previously known heart disease had been excluded, with QT prolongation (38%) being the most common changes seen. 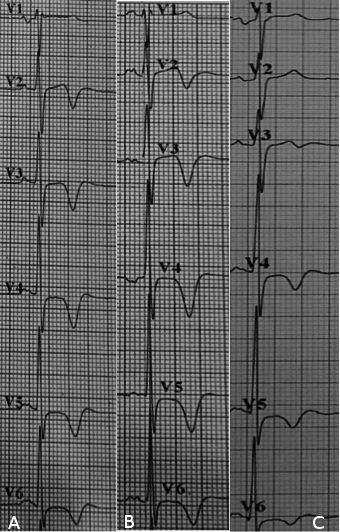 Interestingly, ST elevation (25%) was the second common ECG changes seen in the same group of patients. This finding has significant implication in the context of managing ST-elevation myocardial infarction where a decision of thrombolysis will cascade a disastrous outcome. Whereas in ischemic stroke, excluding those with pre-existing heart disease, the 2 most common ECG changes detected were T wave inversion and ST changes . Figure 5. Progressive electrocardiographic changes from Day 1 on admission (A), 5 hours later (B), and Day 10 (C). Over the decades, Clinical and experimental evidences have suggested that dysregulation of autonomic nervous system can be primarily responsible for the ischemic and repolarisation ECG changes . Direct injury to neurogenic structures in acute stroke causing autonomic imbalance, enhanced by catecholamine storm can lead to myocardial damage and arrhythmogenesis [4, 8]. Previous experimental data also showed significant dysrhythmias on ECG after electrical stimulation of anterior insular cortex, like those in ischemic stroke . Interestingly, the risk of developing arrhythmias in ischemic stroke was significantly higher in patients with right-sided lesions compared to those with left sided lesions [10-12]. The insular lateralization has been extensively discussed in various studies which suggested that strokes involving right insula decrease basal sympathetic response and may result in parasympathetic hyperactivity. On the other hand, left insular lesions decreased parasympathetic activity and augment cardiac sympathetic tone . However, there are other studies that did not show the lateralization, suggesting that further studies are needed to establish the underlying mechanism and connection between insular cortex, autonomic dysregulation, and arrhythmogenesis. A recent study by M. Togha et al. has observed an increased number of patients with abnormal T wave and posterior fossa bleeding. However, specific ECG abnormalities correlated with a localized intracranial pathological change could not be established . While in the presence with atrial fibrillation, acute ischemic stroke is more often the result of cardio-embolism, the ischemic changes on ECG can be secondary to acute stroke. Pathological evidence from autopsies in patients with acute cerebral infarction showed myocardial necrosis and hemorrhagic lesions, termed myocytolysis. These lesions were found near the nerve endings suggesting possibly neurogenic in origin . In the context of acute stroke, the ischemic changes in ECG become ambiguous and not specific for acute coronary syndrome. Most clinicians have been using cardiac markers (CK, CK-MB, Troponin) to aid diagnosing acute coronary syndrome in these cases. In a systemic review, elevated serum CK was seen in 34% in SAH patients after excluding those with preexisting cardiac disease, suggesting its poor specificity in diagnosing acute coronary event . In another systemic review evaluating troponin level after stroke, the prevalence of a positive troponin level in acute stroke was 18.1% . However, the raised troponin is lack of specificity to isolate and diagnose acute coronary syndrome as it can be attributed by myocytolysis, pulmonary embolism or renal failure. Nevertheless, the elevated troponin level in acute stroke has been associated with poorer outcomes, although it is not yet proven as an independent prognostic factor. Similar to ECG changes in acute stroke, QTc prolongation being the common finding poses a risk for ventricular arrhythmia and thus a poorer prognosis. Our review of literature showed that most of the ECG changes are related to anterior circulation stroke. Numerous data are available in the recognition of insular cortex as a key role in autonomic dysregulation, insular lateralization, and myocytolysis. To the knowledge of author, there was no available evidence to explain the relationship of ECG alteration and posterior circulation stroke. Acute coronary event and cerebrovascular accident share the common risk factors. The managing team had made an effort to rule out ischemic heart disease with myocardial perfusion scan. Myocardial perfusion scan with Tc-99m Tetrofosmin has a very high sensitivity (100%) to detect coronary artery disease, with sensitivity of 75% and specificity of 80% for detection of significant (>= 75% diameter) coronary artery stenosis . Although ECG before the admission for the neurology event was not available, the hypertensive left ventricular hypertrophy may contribute to the initial ECG abnormality; his blood pressure was well controlled during the dynamic T and ST segment changes hence unlikely to be the confounding factor for the ECG phenomenon. The managing team concluded that the ECG progression is cerebrogenic in nature, although such phenomenon is rarely reported. There is a complex cerebrogenic cardiac injury and ECG changes. We report this uncommon case of ECG changes in cerebellar infarction to highlight the heterogeneity of the mechanism. Further studies are needed to identify the relation between different types or locations of stroke and ECG changes with or without myocardial damage. Daniele O, Caravaglios G, Fierro B, Natalè E. Stroke and cardiac arrhythmias. Journal of Stroke and Cerebrovascular Diseases. 2002;11:28-33. Ebrahim K, Mohamadali A, Majid M, Javad A. Electrocardiograph Changes in Acute Ischemic Cerebral Stroke. Journal of Applied Research in Clinical and Experimental Therapeutics. 2012;12:53.